At the International Conference on Afghanistan held in Bonn in December 2011 and again at the Chicago Summit in May 2012, the international community made a commitment to support Afghanistan in its Transformation Decade beyond 2014. Thus, as Afghan authorities assume the lead for security in all regions, and the NATO-led combat mission changes in scope, ministerial and institutional development will likely continue as an enduring mission. This mission is currently being conducted under the authority of Commander, NATO Training Mission-Afghanistan, Combined Security Transition Command- Afghanistan (NTM-A/CSTC-A) as a U.S. mission through bilateral agreements with Canada and the UK. 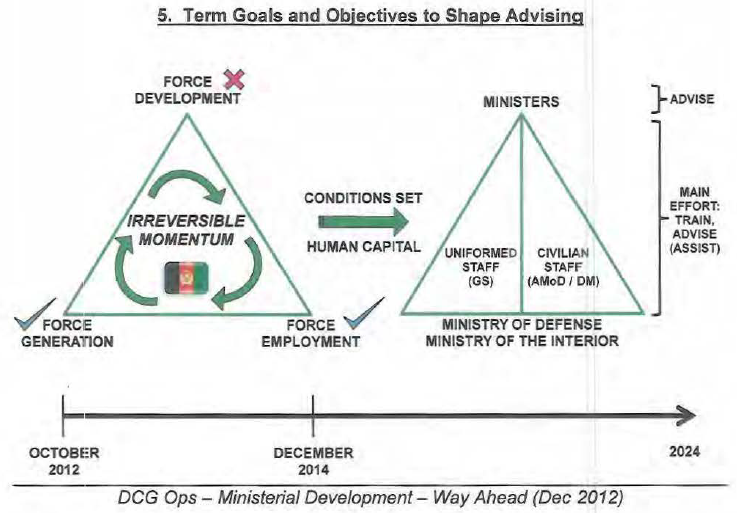 Within the NTM-A/CSTC-A organization, the Deputy Commander- Army (DCOM-A), in coordination with the Ministry of Defense (MoD), generates and sustains the Afghan National Army (ANA), assists in the development of its leaders, and guides the establishment of an enduring institutional capacity in order to deliver a competent and capable Afghan security force. This plan will be reviewed and revised on an annual basis (in November of each year) to ensure that the advising effort and personnel resources are properly adjusted, as the institutional capability and capacity of the MoD and GS c:continues to develop. The original implementation of a MMDP was designed to bring together the quarterly assessments based on the individual office’s Ministerial Development Plans (MOPs) into a longer term, overarching plan. What was required was a conversion from a quarterly view to a long term “until Transition to Afghan control plan supported by advisors with a logical sequence of tasks progressing to that transition point. Diverse attempts at advisor measurement of their respective offices or organizations needed to be consistent and checked for validity. A shift away from strictly qualitative to a mixed qualitativ1e-quantitative method, using several cross-checking methods, brought the MOB pro1cess to a higher level of confidence and assurance about results. Develop an ANA Ministerial Master Development Plan (MMDP) that synchronizes NTM-A/CSTC-A partnering and advising activities within the MoD/GS through to the Fielded Force. The plan should follow selected lin1es of operation that will enable self-sufficiency of the ANA (ie. Personnel Management, Logistic Systems, Operations, Horizontal/vertical integration, etc) in consultation with the MoD/GS with a view to them adopting it as their development plan. We must provide mentored Afghan solutions, be principle-based and incorporate consideration of the Afghan strategic, security, economic, and cultural realities. NATO adaptations to MoD and ANA will be incorporated where they are mandatory for interoperability and where the results are assessed to endure post-ISAF. Develop(ing) a more rigorous way to measure progress in MoD/GS and ANA development. Measuring CM ratings in the field force may be easier to achieve based on training objectives and ETI/OML T or unit partnering. In the MoD/GS this can be more difficult. We must develop straightforward performance measurement criteria that allow us and the Afghans to measure progress with a balance between objectivity and subjectivity. This will be tied to goals and objectives in the MMDP and will be reported regularly at the MAG Advisor Council Meetings and at the quarterly MOB. Feedback to the MoD/GS in a regular, systematic manner. In consultation with the MoD/GS, selectively turn over elements of force generation and employment activities to MoD/GS in preparation for the transition phase of the mission. Engage the Afghan MoD/GS in NTM-A/CSTC-A planning activities to educate and build competencies in order to transition policy development, planning and execution activities that will be required to continue to sustain the ANA in the long term. Take specific, measurable steps in transitioning selected planning and execution activities to the Afghans that are captured in the MMDP. 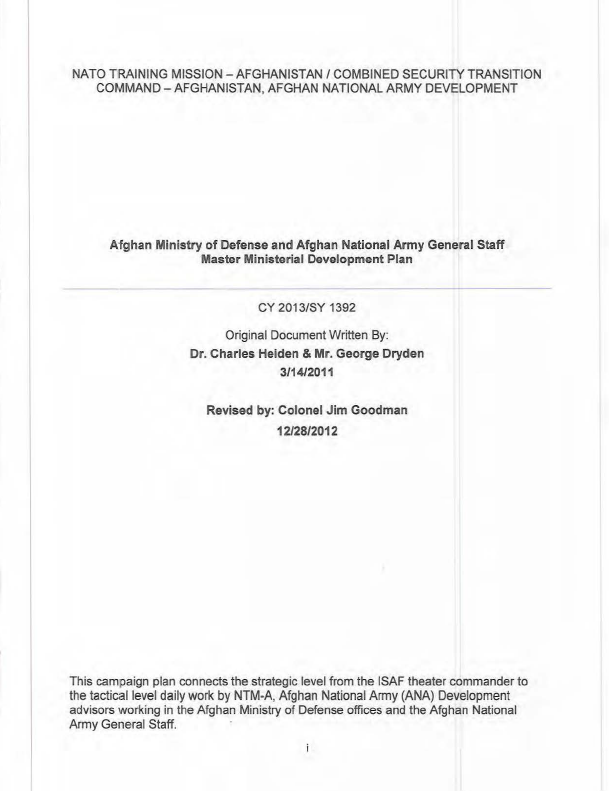 This document will require annual review to capture lessons learned, progress and actions which will adapt it to the future needs and requirements of DCOM-A, NTM-A and ISAF.